The year is 1938 and a viral weapon is being developed that will rival even Tesla's lightning weapon designs! Cue Atomic Robo, Jack Tarot, secret government agencies, moon men, magical arctic circle elves, jetlagged aliens, elderly rights activists, youngling laborers, and the manifestation of human hope to help save the day! 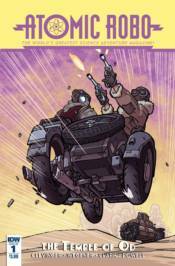 � Atomic Robo blows things up in a blast-from-the-past adventure! � Part of IDW's five-week Creator Visions event! Five creator-driven books, launched in five straight weeks!